Like most of the fixed income market, municipal bond have been crushed. Volatility in Emerging Market bonds surprises no one, but municipal bond investors are often attracted to their reputation for safety. Unfortunately, these investors have learned first hand about overvaluation and duration risk. Back in May 2016 I mentiond that high yield munis were overvalued relative to their risk. The correction started in October. While the equity market has rallied, the munis have sold off, especially high yield munis. Back in May, I shared a chart of high yield munis vs. investment grade muni yield ratios as evidence of high yield overvaluation. At that time the yield ratio was trading near historical lows of 1.15x. ​Below is an update, as you can see, the correction has improved valuations, but they are not yet in line with the historical fair value of about 1.25x. For clarity, here is a YTD version of that chart. You can see how much this metric has moved since May. I believe high yield municipal bonds are a great asset class for taxable investors, provided valuations make sense. The best book I've ever read on the topic is Investing in the High Yield Municipal Market: How to Profit from the Current Municipal Credit Crisis and Earn Attractive Tax-Exempt Interest Income by Triet Nguyen. The caveats I've previously shared on TTM yields still apply here. It seems that during each market correction, investors wake up to the risks of liquidity mismatches. Recent examples include the Third Avenue Funds during the corportate high yield correction of 2015, and UK property funds post-Brexit. While high yield munis ETF funds have not had the same level of issues, the disconnect from NAV illustrated below should concern investors. If you'd like to get notified when I have new posts like this, sign up below. John A. Allison led BB&T Bank for almost 20 years. During this time BB&T executed over 100 mergers. He was recognized by the Harvard Business Review as one of the top 100 most successful CEOs in the world over the last decade, and John was one of four finalists for Morningstar's 2008 CEO of the Year. These are part of Allison's The Leadership Crisis and the Free Market Cure: Why the Future of Business Depends on the Return to Life, Liberty, and the Pursuit of Happiness. ​Before becoming involved in a merger, it is critical that your own organization be running well. You are extremely unlikely to fix a broken system with an acquisition. ​It was also decided that our focus would be on solid or medium performing institutions. Dysfunctional organizations are typically difficult to fix. Also, it is hard to improve the performance of high performers. Why would a high performer sell if there were not hidden issues? Some of our competitors in the acquisition business would justify paying higher prices by assuming very aggressive cost savings...Our experience indicated that an acquirer who paid too much for one company would pay too much for the next company and would be forced to cut costs too aggressively, which destroyed the business it had acquired. Also, as we continued to roll up agencies, the insurance companies whose products we sold took notice because they realized the traditional agency system was not efficient and that we had developed a better model. We began to be able to negotiate better deals with the insurance companies, which allowed us to be more competitive in driving revenue (and sales incentive for employees) for the acquired agencies. Over time, BB&T has radically improved its cross-sell effectiveness, but there is a long learning curve for both bankers and agents. The key decision early on was to focus on having a world-class insurance agency system and then to drive cross-selling. If we truly were able to deliver better insurance products and services to our banking clients, then the cross-sell would naturally follow. A little background, NCNB/NationsBank/Bank of America (same organization with new names) and First Union/Wachovia (the same organization with different names) had both coveted BB&T. The only way I was able to keep either organization from making an unfriendly offer was to play them against each other. I told Hugh that he could make an offer that would probably force us to sell, but I thought I could direct the sale to First Union. I told Ed Crutchfield, who was CEO of First Union, that if he forced the issue, I thought I could direct the sale to Bank of America. Of course, in order to earn the right from a shareholders' perspective to remain independent, we had to outperform the potential acquirers, which we did. 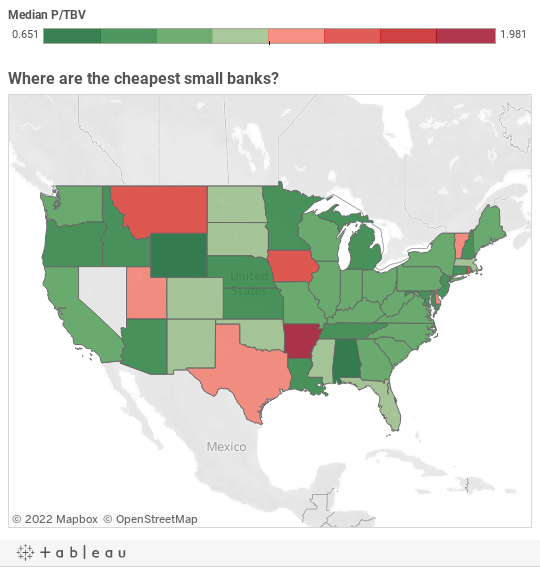 Where are the cheapest small banks? If you are hunting for cheap banks skip Arkansas and check out Alabama. I've been looking for the cheapest small banks. As it turns out, small cap bank valuations are not uniform by geography. Defined as banks with market caps under $2 billion, I compiled data on small banks and shared it below. The metric is median Price to Tangible Book Value per share. I took this metric for every bank under $2b market cap which for I had fundamental data. Namely: price, TBV per share, and headquarters state (thank you ycharts). Then pored it into tableau, which computed medians by state and placed the data on the map. Alaska and Hawaii can be found by dragging or zooming out. Wyoming has only one bank that met my criteria: Crazy Woman Creek Bancorp Incorporated. Ticker: CRZY. Utah and New Mexico also just have one each, but they have just regular, boring, bank names. Why is Arkansas the most expensive? I have no idea. Probably has something to do with Wal-Mart. Two of the three banks in Arkansas that meet my criteria trade around 2x book: Simmons First National Corporation (SFNC) and Bear State Financial (BSF). Seven of the eleven Alabama banks that made the list trade for less than tangible book, making it the cheapest state. Southern Community Bancshares, Inc trades for 0.4x TBVPS. Arizona banks are quite cheap. Three of four trade for less than TBVPS. California has the most banks, but Pennsylvania is a close second. Virginia is a distant third. ​What's the deal with Nevada? Ends up there are are only two small banks in NV, and I don't have data on them. Why no data? Did you know that a bank is permitted to suspend filings with the SEC if it has less than 1,200 shareholders of record? Some of my TBVPS figures are stale by one quarter (4Q15 vs 1Q16). If you are playing along at home and notice a discrepancy, that is it. Bad things happen when people misprice risk. From the credit crisis of 2008, to the tech bubble of 2000, to the panic of 1873, all are the product of human misjudgement regarding risk. Below, I present evidence of a current mispricing in one corner of the credit market. This same phenomena preceded nearly every equity market correction over the past thirty years. I used to work in Municipal Bonds, both buyside (mutual fund shop) and sell-side (bank trading desk). I now follow muni bonds as an allocator at a family office. High yield munis have a greater yield than investment grade munis. High yield muni bond funds have been around for a long time. MFS Municipal High Income (MMHYX) has been around since 1984. We can compare the yield on this fund to an investment grade fund, Vanguard Long-Term Tax-Exempt (VWLTX), to get a sense for "How Much More Yield". Over the past 30 years, high yield munis have yielded 124% of investment grade muni bonds, on average. This ratio is illustrated below. The lower the line, the less investors are being paid to take on high yield credit risk. What is the current yield ratio? 115% and dropping, compared to a long term average of 124%. Relative to investment grade munis, high yield is very, very expensive. Mispriced risk, illustrated. Perhaps something has changed over the past few years to make high yield muni credit fundamentally less risky than it has been in the past, but I doubt it. In fact, with the reduced role of municipal bond insurers since the credit crisis, muni bonds are likely more risky. You may be thinking... so what if high yield munis are overvalued, just don't buy them. Yes, but notice what happens to the equity markets when the yield ratio gets to 115% or lower. So muni bond yield ratios predict stock market corrections? Not really. I would say that over-reaching for yield tends to happen before inflection points in the market. Investors stop respecting risk, and then they pay. Right now, if high yield muni investors are over-reaching, you can bet some other investors are too. If you want to learn more about high yield municipal bond,I recommend this book. The obvious answer: buy gold and bury it in your backyard. In all seriousness, make sure you are being compensated for the risks you are taking... check your asset allocation, it might be time for a rebalance. MFS Municipal High Income (MMHYX) is not a perfect proxy for the Muni HY market. It's actively managed, so that brings some bias into it. ​ However, no HY Muni index funds go back to the mid 80's. If you used an index fund, it would tell the same story, but with shorter time frame. TTM yields are not the best measurement of yield. Yield to worst would be better, but I don't have that historical data. Ideally MMHYX and VWLTX would be very similar except credit quality. They are not, and that brings in some bias. For example, MMHYX currently has an effective duration of 7.43, while VWLTX has a duration of 6.38. There are likely numerous examples one could find that show this is not an perfect apples-to-apple comparison. This blog post will be somewhat off topic, as I diverge from my usual investment focus. Instead I will be telling you a story explaining why I hate Comcast, how I cut them out of my life, lowered my cable bill by 67%, while still being able to watch The Walking Dead and Steeler’s games. Oh where to start? One summer during business school I lived in Philadelphia. When I returned to Pittsburgh I accidentally brought my cable box back with me, which they wouldn’t accept at the local Comcast office. Instead they needed it 5 hours away in Philly, so I reluctantly shipped it back, only for them to never acknowledge that they had received it, and insist I pay for it. Strike one, Comcast. When I had cable “installed” at my new house, the “engineer” (I really am using the word in the loosest possible sense) decided the most appropriate setup involved drilling a hole through my 100 year old floor boards. Strike two, Comcast. I could almost deal with the hole in my antique pine floorboards for a decent cable service, but our service was far from it. After a while, my cable box became as temperamental as a my toddlers, having frequent tantrums. It refused to work, regularly. We would call to get it reset, only for it to decide to stop working again within a day or two. We would schedule an “engineer” to come service it, only for our box to be declare fixed, and the service call canceled. And the cycle would begin again. Infuriating. Strike three, Comcast. You’re out. The final straw So a month or so into this seemingly never ending cycle of resetting our box, only for it to break again a day later, panic started to set in. It was football season and the Steelers were playing in about an hour, and the cable box was a time bomb. And not wanting to risk a loss of service midway through a game I searched for an another way to watch the game. That alternative ended up being a cheap HDTV antenna from Walmart. Predictably our cable did stop working, and all hopes were riding on the antenna, and you know what? It worked like a charm. Since football was the only thing I actually watch live, and I no longer needed cable to do this, what did I need cable for at all? Cancelling Comcast is notoriously difficult, and with such terrible service towards customers who aren’t trying to leave, it’s hardly surprising. However the first person I needed to convince to let me leave Comcast was not some call centre worker, but my wife, who was keen to stick to the status quo. In the end this wasn’t too difficult, however, after I reminded her how much Comcast sucked, and moving the strategically placed furniture to show her the hole in the floor boards again. She was on board. Convincing Comcast to let us cancel our service was a lot more difficult; I ended up doing it in two stages. One, when I got my TV setup installed (more on that in a minute), I called and cancelled two-thirds of the "triple play" as the cable and phone services were now completely useless. We literally never received a phone call for us, only telemarketers and people looking for whomever had that phone number last. First they tried to sell me upgrades to my service, which was annoying, but a few minutes later I only had internet service. I called Verizon for a Fios quote, and at $78 a month I scheduled an install date. I called Comcast back and asked them to beat the Fios price which shockingly, even when I said I was going to cancel as soon as Fios had been installed, they refused to do. I took the 67% discount to my Comcast triple play and moved on to next steps. Fios was installed seamlessly the tech, using the modem I purchased. For a short amount of time I had both services. So I ran some speed tests, and guess what? Fios was twice as fast, for at a lower cost. So eventually I called Comcast to cancel, which was easier said than done since their cancelling office closes at 5pm. Really useful when you work full time, cheers again Comcast… When I finally got them on the phone, I gave them the straight story. Fios is faster and cheaper. You refused to price match. I want out. When I put it that bluntly, they didn’t have much to say. Returning the equipment this time was really easy, just lug that black box to any UPS store and drop it off. No box needed. They scanned the bar code on the back and shipped it back to Comcast at no charge. As mentioned above, my ISP is now Verizon, using my own cable modem. Buying your own saves you $120 a year for no more hassle. This was recommended to me by the Fios guy on the phone, really simple. TV wise, Roku is the hub of everything. I have the Roku 3 which works great, the Roku 4 has since been released and as it supports the faster wifi speeds, I will probably upgrade at some point. The main apps we use are Netflix (which needs no introduction) and SlingTV (not to be confused with a SlingBox). SlingTV gives you access to 25 live cable channels for $20 a month, so I can still watch football and the Walking Dead with everyone else and not have to risk seeing spoilers. You can also add on extra packages for $5 such as kids, sports etc so it is completely customizable and you only pay for what you use. Below is a list of the SlingTV channels. ​I also have an HD antenna. Like I said it’s a cheap one from Walmart, and looks like a pair of bunny ears. However, I put it behind some pictures on top of the tv cabinet and you can’t see it at all, which is just as well as it’s pretty ugly. If I were doing this again today I would buy the Leaf Antenna, as it looks cool and gets great reviews. I get loads of channels, and most importantly I get great HD Steelers games, with a better picture than Comcast ever delivered. And that’s it! After paying Comcast every month for over 10 years, I am now Comcast free. My kids watch the shows they want on Netflix without having their eyes polluted with commercials. We get to watch Steelers games in HD and the Walking Dead. Everyone is happy. ​Not investment advice. Not a solicitation to invest. Don't take candy from strangers. The links above are affiliate links, if you were to click on one and then buy something Amazon would pay me several cents. Back in January of 2015, I landed a meeting with a well-known value investor. While I won't name-drop him on this blog, I will say he has a career measured in decades, and should be familiar to most of my readers. So there I was sitting in his conference room, waiting for him arrive. The purpose of the meeting was to learn more about value investing with an earnings power approach, rather than asset-based value investing. Earnings power vs. asset-based: Asset-based investing is higher turnover, and less efficient from a tax perspective. I was surprised; I had never given much thought to the tax implication of various value investing strategies. He continued: Imagine that you buy a company, watch earnings power grow, and never sell. And then toward the end of your life, you give it to charity. Me: "None", mentally noting he made no mention of dividends. That's right; taxes will never be paid on it. This is essentially what [Warren Buffett] has done. Of course, Berkshire Hathaway subsidiaries pay taxes, but shareholders do not unless they sell. There you have it, the most tax-efficient investment strategy of all time. Total taxes paid: zero. No retirement account needed. Our conversation meandered from there. He asked me if I'd read The Outsiders. He shared his thoughts on who are some current outsider CEOs. ​He also told me about a company he was currently buying. He wouldn't share the name, but said it had a pre-announced bad quarter with some weakness in its energy related divisions. He believed the news immaterial, and he had been researching the company and its competitors for over one year. Based on the fact pattern, I pieced together a guess on which company he was referring to, and his 13F filing confirmed it a few months later. Less than a year later the company was acquired. His admin walked into the conference room exactly 30 minutes after our meeting began. My allotted time was up. I thanked him and went home to review my notes. Not investment advice. Not a solicitation to invest. Don't take candy from strangers. The links above are affiliate links, if you were to click on one and then buy something Amazon would pay me several cents. Have you read How to Buy Bill Ackman, Dan Loeb on the Cheap - Closed-end funds run by these hedge fund pros trade at a discount to net asset value? The setup sound great: famous Hedge Funds are trading cheap ​in Europe, and anyone with a brokerage account can buy! Barron's hints at a wrinkle: ​"Fund investors get an annual Passive Foreign Investment Company, or PFIC, tax form, which is like a K-1 or 1099 form." Barron's neglects to mention investing in a PFIC can subject you to a "Tax Regime" that is about as pleasant as it sounds. ​​"In general, US persons owning stock—even one share—of a PFIC may be subject to tax at top marginal rates, plus an interest charge, on certain distributions and dispositions of PFIC stock. Even an indirect owner of PFIC stock may be subject to the regime." The quote above is from Baker Tilly, who has a good primer on the subject​. In short, you really don't want to be subject to The Regime. If one were to buy Pershing Square Holdings or Third Point Offshore via the European tickers in Barron's ​(PSH.Netherlands or TPOU.UK) or the US listed Pink Sheets ticker (PSHZF or TPNTF), one could in for an unpleasant surprise come tax time. Fortunately, some of this can be addressed by filing to use qualified election fund (QEF) election or a mark-to-market (MTM) election. Furthermore, if you hold these in an IRA, you may be able to avoid the worst of it. However, I would tread carefully on any of these solutions. At this point, I'm going to drop the "talk to your tax professional" phrase. ​ Don't take tax advice from a blog. Especially not this one. So Barron's: Nice idea, but realize US taxable investors (most of your readers) ​should think twice about the tax burden associated with your latest picks. Due to overwhelming demand from readers, I am posting another Joel Greenblatt video. Or rather, some guy named Hunter begged me to post one after reaching out via the contact tab. As an aside, if I ever talk to a group of little kids about investing, I am going to borrow his analogies from the book. One book was The PPLI Solution by Kirk Loury. To be clear, most of this book was a waste of my time. Much of the information was stale, as it was written in 2005. But that doesn't mean I regret the purchase. In fact, one chapter alone made it worthwhile. If you are thinking "what the hell is PPLI? ", I encourage you to read: Tax-Efficient Investing Through Private Placement Annuity and Life Insurance Investment Accounts - A Brief Overview. As an investment professional, I was looking for objective information on PPLI, and Private Placement Variable Universal Life (PPVUL). Instead, I was drowning in the sea of white papers written by brokers who provide potentially helpful, but ultimately self-serving information. This book was no different. Except chapter sixteen. PPLI has been around for a long time as a bespoke structured financial product that could save one a boat load of taxes. Of course, the terms bespoke and structured are code for "very expensive" and "lots of fees". This is the roadblock most run into when considering PPLI. Do the setup fees and the ongoing expenses justify the long-term tax savings? So the real problem becomes how low can you get the negotiable fees and are the fixed fees worth it relative to your asset base? Fortunately, the PPLI space is moving from bespoke towards standardization, and fees are coming down. One indication that PPLI is going mainstream (or as common as a product for affluent investors can be) is MONEY: Master the Game by Tony Robbins. While I have not read this book, Awaken the Giant Within on Audible is one of my favorite things to listen to on a long drive; there is a reason it is considered a classic. The book then provides an example spreadsheet with these costs, circa 2005. I am writing this in 2016; the costs quoted to you should be lower than those in the book. Also, the book will make it clear which of these fees are negotiable. For those that are looking for really low fees, in my research I have found a way to "go direct", but it is not for the faint of heart; there is no broker to hold your hand. A quote from this type of source should provide the lowest cost example, and could be used as leverage to get a lower rate from your broker. To be perfectly clear, I don't sell insurance, nor am I licensed to sell insurance. Please don't contact me regarding how to purchase PPLI, I cannot help you in that regard. Not investment advice. Not a solicitation to invest. Don't take candy from strangers. The links above are affiliate links, if you were to click on one and then buy something Amazon would pay me several cents. Joel Greenblatt literally wrote the book on special situation investing, so it's fitting that he teaches the Value & Special Situation Investment class at Columbia Business School. This particular lecture is interesting because it encompasses a wide spectrum of the value framework; a special situation (spin-off) and a wonderful business (Moody's). It is also caught my attention because it features Rob Goldstein, partner at Gotham Capital. Before this lecture I was familiar with just one-half of Gotham's high performing investment partnership. Goldstein does a case study of Moody's (MCO), which went public via spin off from Dunn & Bradstreet (DNB) in September 2000. The challenge is paying up for quality. To find a comp., the Gotham team used Buffett's 1988 Coke (KO) investment as an example of paying a premium for quality. I have a fond opinion of Moody's as when I was a credit analyst, Moody's was was the more conservative of the rating agencies, and I used the "Moody's medians" as the benchmark for much of my coverage ratios. The second half of this 2 hour+ video is Greenblatt lecturing on "The Little Book" to his CSB class. That will be the second of two posts from this video. As usual, if you don't want to watch an hour of video, my notes are below. All the charts I've included go to the time of the lecture November 2006, for proper perspective. Gotham came across Moody's in 2000 when spun off. It is one of the greatest business they've ever seen, but its not cheap. Moody's was spun off at 21x forward earnings, 24x trailing earnings. They typically bought at 10x earnings at that point. Q: Why compare Moody's to Coke? A: One of the best franchises ever, Buffett bought at a high price but it continued grow and was cheap in retrospect. It's a high hurdle. Buffett bought Coke (KO) at 13x forward earnings, 15x trailing earnings. Turned $600m in $7B in 12 years, about 23% annually. Reasons include price increases, buy backs, dividends, P/E expansion. Q:What was so great about coke? A: High ROIC, great brand name, safety of franchise, easy to understand, predictable business. Three important things about Coke: organic growth, high ROE, lasting competitive advantage. Moody's: founded in the 1900's, originally charged investors for bond ratings, but ratings became so important, that debt issuers began paying for the ratings (1970s). Pay for rating or face higher borrowing costs. Moody's and S&P each have 40% market share, and most issuers pay both. Over past 19 years before 2000 spin off, Moody's revenues grew at 15%, operating profits grew at 17%. Revenue grew almost every year (with one exception). Can we extrapolate this forward? What is the BTE? Goldstein believes that there is no chance of a 3rd major player. Student brings up Fitch. Goldstein says they are a niche player. They are a big part of the other 20%. No one likes two dominant players but there is nothing they can do about it. Various solution suggested. There is not a practical solution to problem. Also one would be messing with the balanced workings with financial markets. Revenue model: Fee on issuance, fee to maintain rating. but fee's are very low relative to face value of debt. Emory's note: This is like the path critical, low cost relative to value, ideal business as mentioned by Jeffrey Ubben of ValueAct. Concluded Moody's is a great business. Moody's did very well over time due to the rise of bond issuance globally, securitization. Moody's was spun-off from Dun and Bradstreet. Pre-spinoff D&B traded at $27.75, post spinoff D&B component was worth $7.50 a share, implied Moody's price was $20.25. Moody's expected to earn $0.95 a share, this is roughly 21x earnings. For Moody's: What growth rate can we assume? Make assumptions about volume and price. We can expect volume to grow, based on Asia demand, ect. They settled on 12% operating earnings growth rate, based on historical performance, and they don't see the drivers changing. This also matches Coke, for an easy comp. What is the return on capital? Since Moody's gets paid on time or in advance of delivering service, and there is no physical good to deliver, the return on capital is higher than Coke. In fact, it is infinite (denominator is zero), due to the pre-paid nature. Very few businesses can claim to have infinite ROC. Coke needed to spend 20% of its earnings on reinvestments, while Moody's needed to reinvest none of it. Coke produces $0.80 on revenue, Moody's produces $1.00. Question: Does that mean Moody's is worth 25% more than Coke (all things being equal)? Answer, yes, at this time, but as growth rates decline the story changes. For Coke: Rearrange GR/RIR=ROE to GR/ROE=RIR if growth declines to 5% --> 5%/60%=8.3% Reinvestment Rate has declined from 20% to 8.3% as a result of lower growth. So to split the difference they decided Moody's was 15% better than Coke (not 25%). This is a more conservative assumption. They were very comfortable with management. Management were good, and didn't think they were going to screw it up. Buffett owned it, management spoke with him. Management compensation was in line, and they said they would return all excess capital through buy backs. What if Buffett paid 18x earnings? He would have still made 20% annually. This is roughly 40% more (18/13=1.385). Goldstein concluded Buffett could have paid a 40% premium and still done great. A note on interest rates: They declined from 9% to 6% from Buffetts Coke 1998 purchase to the Moody's 2000 spin-off. A bond would have gone up 42% over this time, which matches that 40% premium we factored in before. In the first year after spin off Moody's was up 50%. Gotham sold too early, but it was 30x earnings. Holding on looks easy after the fact. In 2001, profits were up 40%, and the next few years were up 25%. Drove shares higher. Greenblatt: We did learn something from selling too early. When we have one of the top five businesses of all time, we need to think three or four more times before we sell, after you've bought it well.